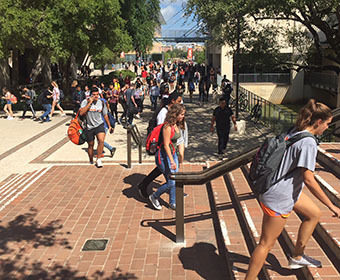 (Feb. 21, 2019) – UTSA today announced several action items aimed at developing a more inclusive campus. Under the leadership of Myron Anderson, UTSA’s founding vice president for inclusive excellence, the university is shaping policies, setting goals and providing strategic direction for the journey toward improving the campus climate for underrepresented groups. The Provost’s Diversity and Inclusion Advisory Council today released the results of the student diversity survey that was administrated last spring. Results from a similar survey administered to faculty and staff were released last year. Next week, UTSA President Taylor Eighmy will officially announce a new President’s Initiative on Inclusive Excellence, which will provide a framework for UTSA’s first steps. It will include future planning for a comprehensive campus climate survey that will allow the university to gather information on multiple dimensions within the inclusive excellence spectrum, as well as measure UTSA’s progress with peer universities in a systemic way. “Understanding how we’re doing in a quantitative sense is important, but just as important is hearing from the many individual voices that make up the fabric of this community,” said Anderson. As a result, Anderson will hold small group sessions for faculty and staff to share thoughts, experiences and ideas on inclusive excellence at UTSA. Each session will be limited to 25 participants.